in food there is truth. Follow LobsterCraft on Facebook & Twitter for location details! “L.B.L.T.” Lobster Roll Is a twist on an old favorite. Bacon, lettuce and tomato topped with a little mayo and fresh hot lobster! 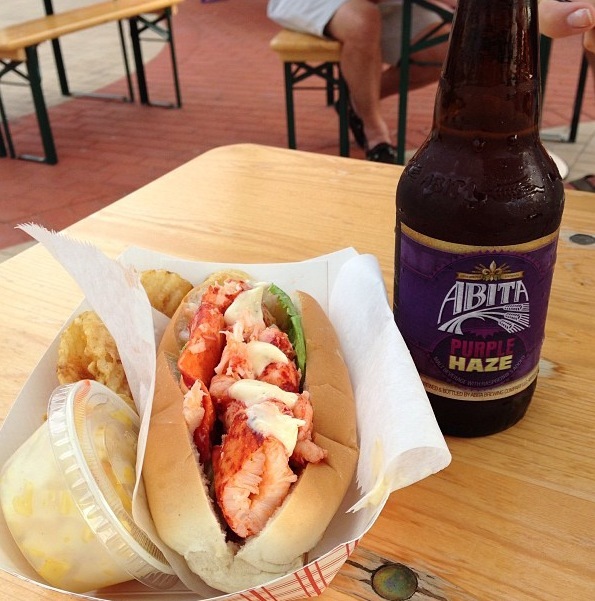 The “Knuckle Sandwich” Lobster Roll is made with only the knuckle meat! Let em’ have it! I had the LBLT & LOVED it! However….I did share the Lobster mac & cheese with a friend and sadly it was disappointing. Cheese wasn’t gooey/melted..it may be better if another cheese was added or if a different cheese was used all together. I’d like to think I got it on an off day. This entry was posted in Food Trucks, Greenwich, Norwalk, Stamford and tagged Bacon, beer garden, beer garden harbor point, beer garden stamford ct, California, cheese, ct, ct 2013, Facebook, ferry to food trucks stamford, Fish and Seafood, food, Food Truck, food trucks, food trucks connecticut, food trucks in greenwich connecticut, food trucks in stamford connecticut, french fries, Greenwich, Lobster, lobster roll, LobsterCraft, Macaroni and cheese, Norwalk, stamford, Twitter. Bookmark the permalink. the time to discuss this topic here on your website.